How much you selling? I have a friend who might be interested to get one. 1) I suppose it is not important for a car volt meter, but I'd like to know (roughly) the input impedance of the meter. 2) Is the voltage input same as the power supply? If same, do you need to connect it after the ignition switch? 2. Yes, the voltage input is the power supply. 3. Trending can be done if needed... There's still room for codes inside. Btw, since the unit take power from the car battery, I suggest wiring it to accessories power line (similar to Radio, cigarette lighter, etc). During ignition, the power to the accessories will be cut thus preventing dangerous spikes from effecting the accessories and this unit. OK. The impedance is high enough. If you can provide voltage trend, can you also provide display off, so that the meter can be connected directly to the battery full-time (to monitor trend) but display is switched off when the ignition is off to lower the consumption. We can take care of power spikes with those ferrite rings. Another good feature is to display lowest and highest voltage within the same 30 minutes trend. These features may help us determine if the battery condition is deteriorating and a battery change is imminent. Bolehkah? Now I'm getting more interested. 1. Voltage in morning is around 11.9-12.1V (accessories on). 2. After ignition it's about 14.5V, constant current charging. 3. After about 15 minutes of driving, it's about 13.5V-13.8V, top up charging. 4. During driving it vary about 0.5V. 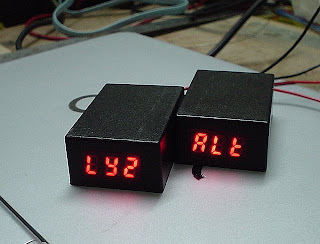 Display current voltage for 5 to 8 secs. Flash Lowest voltage for 2 secs. Yes, battery deterioration is not overnight. But it is difficult to monitor with just a simple voltage reading. The good guide will be the voltage trend in the first 30 minutes of charging when you start driving around in the morning, and the 30 minutes after you switch off the engine. One more thing about capturing the trend. When displaying the current trend, please exclude the latest 2 readings. This means that the trend should be 3 to 6 mins delayed. This is to ensure that when you start your car in the morning, the immediate charging do not affect the trend reading. Also, if the voltage varies less than 0.3V in 8 readings, voltage should be regarded as constant. For displaying highest and lowest voltages, 30 mins time span is not good enough - coz if you drive around longer than 30 mins, the lowest voltage reading become meaningless. Maybe 24 hrs data taken at 30 mins interval? What do you think? So modifications are in the programming only, except for display off feature. Current Value: 12.5V (both current value and lowest value will be the same). How would I be 'better' informed through these? OK. My initial description was confusing. Sorry. The Highest and lowest reading is NOT related to the trend. Highest and lowest values are taken over 24 hours. The trend is taken over last 30 minutes. Remember the meter is connected full-time to the battery. Only display comes on when key is switch to ACC. However, Hi and Lo readings are also a good indicator of a weak battery. I'll email you a graph to describe the trends. On second thoughts, based on your data which quite conforms to my observation on my car, and also to make your programming easier, I think a shorter period for trend monitoring is more meaningful. So I suggest you store 4 readings taken at a 3-minute interval, and use the previous 3 readings for display. This means the trend is monitored over the last 9 - 12 minutes. In this case, a voltage difference of less than 0.2V should be treated as constant. What if you want to check the voltage reading without starting the engine? Just turn the key to ACC should turn on the display. This on time of 0.5s is only to display current voltage, isn't it? What about other Hi, Lo, and Trend readings? I still prefer adding a sense wire to the ACC provided you have a free input port available.